SOMADEVI ANGKOR HOTEL & SPA is indeed a Hotel of Class and Character in which you should not miss while you are visiting the mystical land – Siem Reap Angkor. The Hotel has been designed to guarantee you a most pleasant and memorable stay as we aim to deliver products and services that consistently meet and exceed your travel’s needs and wants. 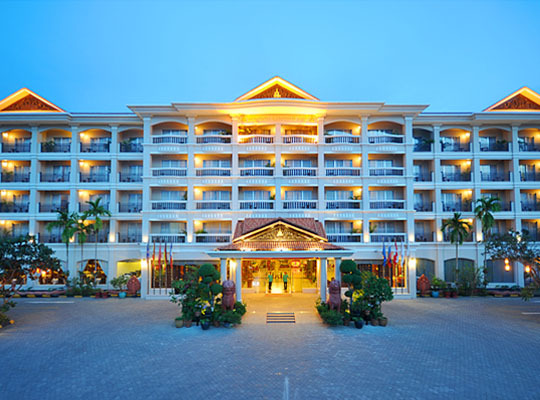 SOMADEVI ANGKOR HOTEL & SPA is conveniently located in the Heart of Siem Reap Town within walking distance of Top Business, Restaurant, Shopping, Museum, Bank, and Entertainment Centers. The 4 Stars Hotel located in the middle of tourist attraction. It is opposite the Mekong Angkor Palace Hotel. ( Single, Double ) : All rooms are elegantly furnished, well decorated and come with spacious living room, individual balcony, Wireless Internet Connection, and offer a sensational view of the Swimming Pool and our tropical landscaped Garden. ..